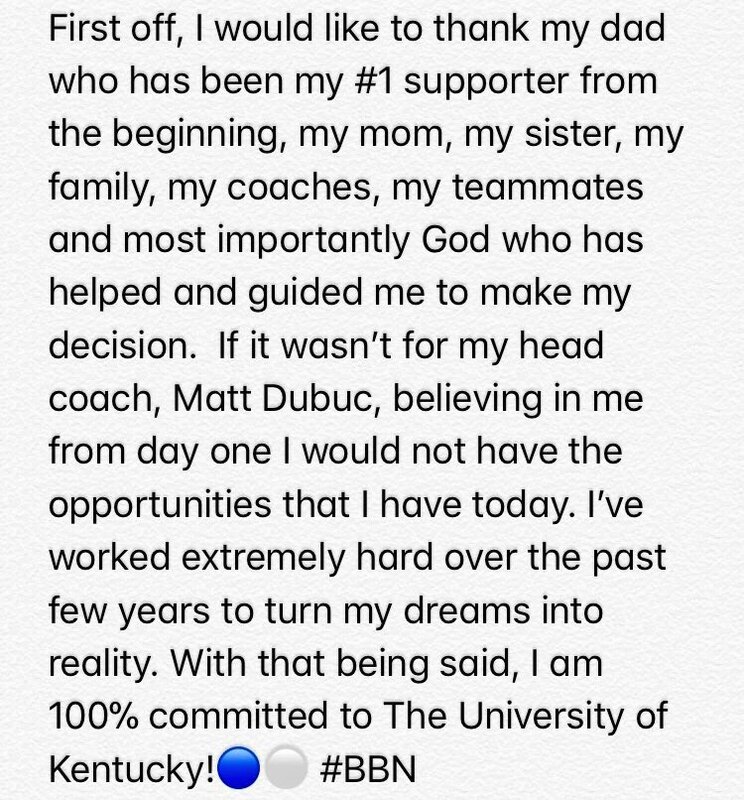 Kentucky has found its quarterback for the class of 2019. 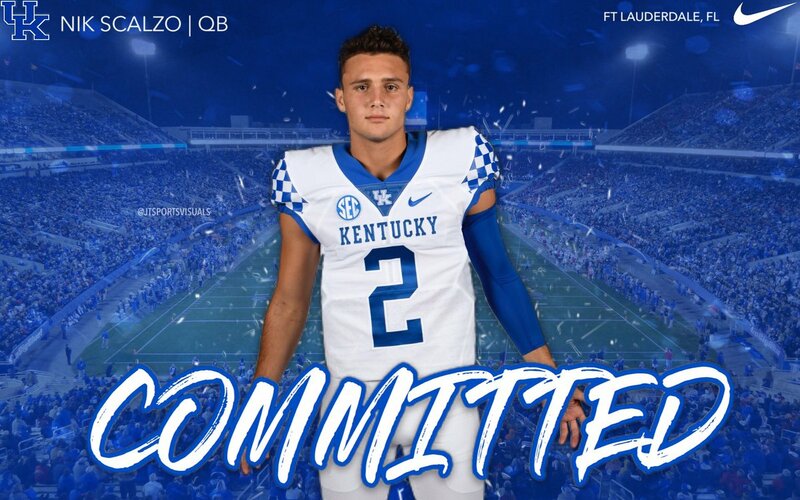 This afternoon, Florida three-star dual-threat quarterback Nik Scalzo made the decision to become a Wildcat. He committed to Kentucky over the likes of Georgia State, Tulane, Kent State, Louisiana-Lafayette, and Akron, among others. Kentucky’s newest commitment visited Lexington back in April, and co-offensive coordinator Darin Hinshaw followed it up by visiting him in Florida last week to seal the deal. Scalzo has earned Sun Sentinel first-team All-County honors each of the past two seasons. He threw for 2,065 yards and 23 touchdowns last season on 175-307 passing. His sophomore year, Scalzo managed 2,221 yards and 27 touchdowns, leading his team to the regional semifinals. In an interview with the Sun-Sentinel, Scalzo said it’s a dream come true to play for the Cats in the SEC. Benny Snell offer sheet: Bowling Green, Toledo, Miami (OH), Cincinnati, and Iowa. I’m sure that has A LOT to do with the fact he is only 5-10. He would be a shortest SEC QB to see the field since the 70s. Awww, it’s cute that bluegrassstfu cares enough to try to troll KSR. Don’t you have some scandal or other to keep you occupied? Only small programs offer this early. Big ones know they can come and get him if/when he improves. Idiotic generalization. Schools offer when they offer. Some coaches play with their recruits like meat, others are straight up. Wow. Benny Snell and Josh Allen! Why are we wasting time going after 4 & 5 star players? Let’s go after the MAC players. I’m sure Stoops can develop those types of players into SEC champions! He has a rich history of player development. I am a Stoops supporter. Anyone who thinks size doesn’t matter for quarterbacks has never played college football. Taking Scalzo’s commitment is a mistake, but it probably won’t matter in the final analysis since Terry Wilson and Danny Clark will control the quarterback position indefinitely. By the time Clark graduate, Beau Allen will probably be the man. With Wilson and Hoak being sophomores, and Clark a freshman, there is so much congestion at the quarterback position now that they may have felt taking a flyer on Scalzo would be the best they could do this year. Joker thought Randall Cobb was too short to play QB. That was a big mistake, too. He could’ve recruited around the man instead, built a team and an offense for a decade. Worked out good for Randall, but he would’ve been successful regardless. I hope this kid has the heart and relentless drive of Cobb. If he does, I expect him to do great things and hope he does so as a Wildcat. Coaches like to add at least 1 QB per class. Yes yes yes. Bring # 1 with you also. He looks like a favorite receiver that can pick up yards after the catch. Watched too many short quarterbacks be successful to worry about size. Hope the baker mayfield comparison is right! Watched even more fail, too. Rolling the dice with this offer, and it’s not a Yahtzee yet, IMO. Time will tell if the subsequent roll will produce a Yahtzee. Nice pickup, IMO. Even if he doesn’t work out, we will at least have a solid dual threat QB to practice against. I see no downside to this.